The purpose of the study was to determine whether the pre-treated MR texture features of colorectal liver metastases (CRLMs) are predictive of therapeutic response after chemotherapy. The study included twenty-six consecutive patients (a total of 193 liver metastasis) with unrespectable CRLMs at our institution from August 2014 to February 2016. Lesions were categorized into either responding group or non-responding group according to changes in size. 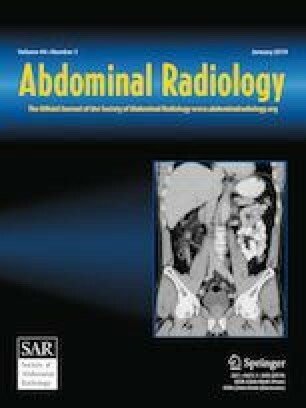 Texture analysis was quantified on T2-weighted images by two radiologists with consensus on regions of interest which were manually drawn on the largest cross-sectional area of the lesions. Five histogram features (mean, variance, skewness, kurtosis, and entropy1) and five gray level co-occurrence matrix features (GLCM; angular second moment (ASM), entropy2, contrast, correlation, and inverse difference moment (IDM)) were extracted. The texture parameters were statistically analyzed to identify the differences between the two groups, and the potential predictive parameters to differentiate the responding group from the non-responding group were subsequently tested using multivariable logistic regression analysis. A total of 107 responding and 86 non-responding lesions were evaluated. A higher variance, entropy1, contrast, entropy2 and a lower ASM, correlation, IDM were independently (P < 0.05) associated with a good response to chemotherapy with the areas under the ROC curves (AUCs) of 0.602–0.784. Variance (P < 0.001) and ASM (P = 0.001) remained potential predictive values to discriminate responding lesions from non-responding lesions when tested using multivariable logistic regression analysis. The highest AUC of the predictors from the association of variance and ASM was 0.814. MR texture features on pre-treated T2 images have the potential to predict the therapeutic response of colorectal liver metastases. The authors declare that there is no conflict of interest regarding the publication of this paper. This study was supported by the National Natural Science Foundation of China (Grant No. 81501437).